When I first read a synopsis of Supernatural, I was excited. I love learning new things and ideas in this area. I have to say after reading a few chapters it wasn't what I thought it would be. 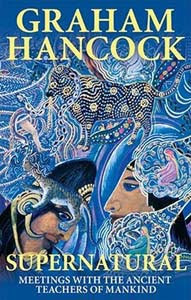 It starts out with Hancock describing his experience with a session of a hallucinogen. He wasn't experimented with such drugs just for the fun of it. He did it to prove a point. Throughout part of the book, he makes a case as to how hallucinogens help shamans reach another realm of existence. This includes how some images depicted in cave art links the hallucinations they have (there are illustrations throughout the book to show you what he is referring to). Next, his arguments shift to UFOs and hallucinogens. You would think it proves aliens don't exist and it's all in our minds. Actually, it's the opposite. Many of those who have had experiences with hallucinogens describe similar images including that of an alien-like figure. His belief is that they help connect us to them. Skeptics may think that's a stretch especially since we are basically taught that hallucinations are nothing and we shouldn't believe what we see. What if they are actually real? Fairy abductions factor in this equation as well. These took place throughout Europe before UFOs became popular in the 1960s. Fairies were known to "take" people randomly to Fairy Knolls, some never returned. Others were taken to be midwives or mother figures for hybrids. They were also known to switch "Changelings" for human babies. Some even claimed to be "tortured by fairies" much like the alien operations. These stories mimic those of UFO abductees. Is it possible they are one in the same? Maybe considering there hasn't been a fairy abduction since UFOs came into play. Last stop in the book tour, is DNA. It's a popular theory we owe our existence to a comet hitting the earth carrying an organism of some kind. In Hancock's book, he explains how some scientists believe it may have been more than that. Actually their thoughts are that our DNA may actually contain messages recorded by "clever entities" which we can access during sessions with hallucinogens. Since the function of 97 percent of our DNA is unknown, I can see how someone would propose such a theory. Most scientists have thought the large portion was nothing but junk DNA that it didn't really serve a high purpose. Francis Crick, co-discoverer of the structure of DNA, supposedly admitted to his colleagues that he was under the influence of LSD when he came up with the double helix shape. Does that prove our DNA holds some secret message(s). I really don't know. The drug may have picked up information he already knew. This is but a large taste of what you'll find in Supernatural. If you love reading and learning about the abnormal aspects of life, you will love this book. I think anyone willing to put themselves out there and test their own theories (even if it means putting yourself through some risky "experiments"). Graham Hancock has that way of making you really think about what society has taught you. People have been captivated with the paranormal and the mysterious for centuries. But such explorations are not without their dangers. As one person wrote on another blog, "I did come across a web page where someone was giving instructions on how to open a portal on a wall, by visualizing a swirling purple mist. While I haven't done that yet, I have been spending some time the last 4 nights, scrying into a black mirror (just getting into this). And last night was the first time I've actually gotten to see something. It was a red-violet mist swirling all around the mirror. But it got me thinking, could I wind up opening a portal through this scrying mirror?" People often get involved with things which are over their heads - and to their detriment. lonny dagostini explained, "Portals are said to reside in natural features of the land, places of power in the landscape used by shamans and others for centuries to connect with the spiritual world. Also called doorways or vortices. They are thought to be inherent structures of the astral plane. Those who study hyper-dimensional physics have a rudimentary understanding of the mathematical and geometrical laws which govern these structures. Some portals are alleged to exist in rock which has been worn away by either wind, sand or water or by two trees that grow close enough that their branches overhang and connect to one another. There are accounts of people seeing them in forests but have avoided them out of fear. Occultists teach that identifying these places requires a great deal of study and familiarity with the environment. And they offer certain “clues” such as a "place between places" - a certain cave, a spring or waterfall, a beach, etc. They also teach that there are certain times, called "thin" or liminal times when the partition between the physical and spiritual world is at its thinnest point. They call them "the times between times" – mid-summer's eve, mid-winter's eve, dawn, twilight, etc. Understand that angels do not need portals to communicate with people. Attempts to open or access portals are always a dangerous practice because you are invoking demonic forces. If you lived in the inner city would you open your door simply because someone told you to? Satisfy your hunger for the spiritual at the table of the Lord and not in the dumpsters of occultism."